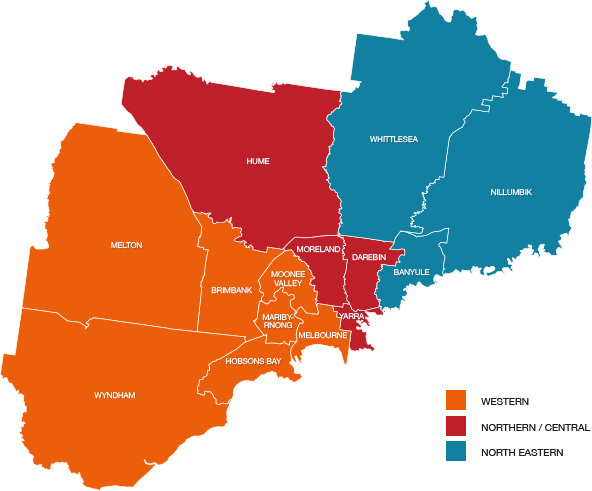 The north and west metropolitan region of Melbourne (NW Metro) covers fourteen local government areas (LGAs) with three community palliative care sub-regions. The western part of the region includes the LGAs of Brimbank, Hobsons Bay, Maribyrnong, Melbourne, Melton, Moonee Valley and Wyndham. This is the community palliative care catchment area for Mercy Palliative Care. The northern/central part of the region includes the LGAs of Yarra, Darebin, Moreland, Hume. This is the community palliative care catchment area for Melbourne City Mission Palliative Care. The north-eastern part of the region includes the LGAs of Banyule, Nillumbik and Whittlesea. This is the community palliative care catchment area for Banksia Palliative Care Service. Measured by population, NW Metro is around one third (33.1%) of Victoria and nearly half (44.0%) of metropolitan Melbourne. The region is expected to grow by over half a million people (521,478) in the ten years to 2026. The ageing population of the region (people aged 70 years or older) is expected to increase by more than half (50.6%) in the ten years to 2026. The population of the region includes around one quarter (24.8%) of Victoria’s Aboriginal and Torres Strait Islander population. The region is culturally diverse, with three out of every ten residents of the region (29.8%) being born in a non-English speaking country. In 2015, there were 10,143 deaths of residents in the region, around one quarter (25.4%) of all deaths in Victoria (39,904).